School was dismissed in eerie silence. Tears welled up in my eyes as I walked the half mile home that afternoon. My sorrow was almost overwhelming for a sixth-grader, not only because our President was dead, but primarily because in my heart of hearts I believed that he was in hell. He was a Catholic, and I was a Christian Fundamentalist. I was the second child in a family of four children, the only boy. Since my father was a Fundamentalist preacher, I was what people often called a “PK” (preacher’s kid). My parents had met at Houghton College after my mother transferred there from Nyack Bible Institute in New York. They returned to Chicago and were married by A. W. Tozer, a well-known Fundamentalist author who was also their pastor. I was born while my father was attending Dallas Theological Seminary. At various times, both of my parents taught at Moody Bible Institute. I have fond memories of sitting in church every Sunday listening to my father preach. Through him, I had an education in theology before I ever attended seminary. Every Sunday, we attended church for Sunday school, morning worship, evening worship, and youth group. We also faithfully attended Wednesday prayer meeting and Friday youth group each week. Our entire lives revolved around our church. The only annual religious celebrations our church observed were Christmas and Easter. Other than those two holidays, I had never even heard of a “church calendar” that recognized the events of the Incarnation every year. We did celebrate certain secular holidays, however, such as Mother’s Day. Although we believed that Fundamentalist Christianity predated the Reformation, we still accepted the twin pillars of the Reformation: sola scriptura (Scripture alone) and sola fide (faith alone). A person became a Christian, we insisted, by believing that Christ died to pay the penalty of sin, admitting that all his own efforts at heaven were useless, and accepting Christ as his personal Savior. A single prayer was the only prerequisite for a “personal relationship” with God. On a practical level, being Fundamentalist meant keeping oneself separate from the evils of the world. As such, I did not dance, attend movie theaters or the ballet, use tobacco, drink alcohol, swear, play cards, gamble, or date non-Fundamentalists. (Our Southern counterparts also forbade males and females to swim together.) I was almost thirty when I first stepped into a tavern. When I took my own children to see old Walt Disney reruns, I was seeing the movies for the first time. The adults around me lived up to these standards, and their example made it easier to live this way. I never detected any of the hypocrisy in my parents that the major media tried to portray within Fundamentalism. My parents taught me that commitment to the truth was always worth any sacrifice. I was taught always to be polite and neighborly to Catholics and other people we considered to be non-Christians. Yet always we had the desire to see them some day become true believers like us. I was trained in how to turn a friendly conversation into one in which I could share the Gospel. When I was in a social situation and failed to accomplish this goal, I felt a twinge of remorse, or even guilt. Our worldview divided the world into very neat categories. Fundamentalists were the true Christians like those of the early Church. Liberals questioned the fundamentals of the faith. This group included most non-Fundamentalist Protestants. Liberals might make it to heaven, but it was rather unlikely. It was bad to be a liberal, but it was much worse to be a Roman Catholic. Catholics were not even Christians, we believed, because they did not understand that salvation was by faith alone. We believed Catholics were going to hell because they tried to earn their salvation by good works rather than trusting only in the finished work of Christ on the cross. No one was good enough to earn salvation. We could prove that from the Bible. Most converts to Fundamentalism were former Catholics. Although they were not saved, at least Catholics could be convinced from the Bible that they needed to be. The last category was made up of those people who were total unbelievers. There weren’t that many of them around. I met my first atheist during my junior year in high school. All through history, we believed, God had preserved a remnant of people who protected the truth just as we Fundamentalists did now. It was easy to see that the Roman Catholic Church did not contain these believers. All one had to do was look at their beliefs. Didn’t any Catholics ever read their Bible? We were convinced that so much of what they believed was in direct opposition to God’s Word. (I had never actually read any Catholic theology for myself, but nonetheless I was sure that I knew what Catholics believed.) We seldom pondered the many areas of agreement we had with Catholics, such as the divinity of Christ, the virgin birth, and the inspiration of Scripture. It has been said that few people disagree with what the Church actually teaches, while there are multitudes who disagree with what they mistakenly think she teaches. I fit into the second category, finding offensive many teachings that I thought were Catholic. I thought it was obvious that Mary had not remained a virgin after Christ’s birth, since the Bible mentions the brothers of Jesus. I could see no basis for a belief in the Assumption or the Immaculate Conception. The view of Mary as Coredemptrix and Mediatrix seemed to lower the role of Christ as our sole redeemer and mediator. Catholic prayers to saints and veneration of images and relics also seemed to impinge on the authority of Christ. The belief that our own works were involved in our salvation seemed to fly in the face of Bible verses I had memorized as a child. How could water Baptism be essential to our regeneration? That seemed too physical, too superstitious, too medieval to be true. Purgatory flew in the face of Christ’s finished work on the cross, as did the sacrifice of the Mass. Everyone knew that indulgences had proved to be so susceptible to manipulation. The idea that a mere man, the pope, could be infallible — well, that idea was hardly worth addressing. Even the few Catholics that I did know did not seem to believe that idea. The practice of adoring a wafer of bread and chalice of wine seemed to be as foreign to true Christianity as anything of which I could conceive. I would never have addressed any non-relative as “Father,” especially a priest who had never married and had children of his own. Why would anyone confess their sins to a mere mortal when they could go directly to God and be forgiven with so much less trouble? Everyone whom I respected was convinced that the Catholics had inserted books into their Bible to bolster these false beliefs. With their traditions, the Catholic Church belittled scriptural authority. As is evident, there was very little distinctive to the Catholic faith that I had not been trained to reject. But what made things even worse were lukewarm Catholics. It seemed that Catholics lacked any deep commitment to their beliefs. Was it because they did not undergo adult Baptism? In Fundamentalism, babies were never baptized. Baptism was not a sacrament that actually changed someone. Nor did it bestow anything. Baptism was merely an ordinance that we did as adults for one reason: to show our obedience to Christ’s command. Since a baby could never do that, it was reserved for teenagers and adults. I remember being baptized at age fourteen by my father. I publicly announced my faith in Christ, and he baptized me in the name of the Father, and of the Son, and of the Holy Spirit. I was then completely immersed in what I recall was extremely cold water. In the years leading up to my baptism, I had answered numerous “altar calls.” An altar call was frequently given at the end of a service. While singing a hymn, people in the congregation were urged to walk down to the front of the aisle and meet with an elder of the church. The elder would then lead any who came down in prayer to receive Christ as personal Savior. The catch-22 was this: How did you know whether your faith was strong enough to save you? As a child, I repeatedly would hear the altar call and wonder, “What if I was not really sincere last time?” The best solution was to go down again and make sure. Since faith was all it took to be saved, it was important to be sure that the faith you mustered up was genuine! It was sometime after becoming Catholic that I realized my baptism had been a turning point. Although it was too subtle to notice at the time, in hindsight I realized that my relationship with God had turned a corner at my baptism. Before it, I had continually wondered if my faith was strong enough, and walked the aisle in an effort to make sure. After my baptism, I had a deep assurance that God was my loving Father. I no longer doubted that He wanted me to go to heaven even more than I did myself. Without knowing it at the time, I had experienced my first sacrament. God had imprinted my soul with His mark. I was His. It would take me decades before I would appreciate this truth, but God had given me the grace of faith through a sacrament. I did not totally understand the sacrament (who does? ), but I did want to be baptized in accordance with Christ’s command. In His grace, God had carried me the rest of the way. Years later, I was amazed that the Church steadfastly refused to rebaptize me after investigating my initial baptism. As a Fundamentalist, I had seen many Catholics rebaptized when they left the Catholic Church. In seminary, I was taught that rebaptizing Catholic converts was necessary. The seminary I attended was Evangelical Protestant. Perhaps I should define terms here. Within a few generations after the emergence of the Fundamentalist movement, many Fundamentalists had adopted for themselves the name “Evangelicals” instead. This “Evangelicalism” became in certain ways theologically broader than Fundamentalism and more accepting of modern culture. Many Evangelicals laid aside the strict Fundamentalist rules against attending the theater, playing cards, and the like. I met some wonderful professors and fellow students at the seminary. I learned a great deal, but some lessons stuck with me even after I left. First, my Church history class was taught by a devout Presbyterian. I came away from the course with the distinct impression that the Protestant Reformation was very complex. There were important political forces at play that overshadowed any theological disagreements. This fracturing of Christianity had continued right down into our own day. I had seen congregations split over “theological issues.” But when all the facts came to light, a different story usually emerged. There were political disagreements in these congregations that were at least as important as the theological. There would be two strong-willed men, or two groups of men, that simply chose to split a congregation rather than submit to any authority. Theology was many times the public justification, but certainly not the entire reason. I also discovered that when Protestants study early Church history, they rarely read the primary sources at length. We read a great many comments about what the early Church Fathers believed. But any actual writings by the Fathers were read in snippets. I later found what I thought might be a large part of the reason why. When I read the Fathers on my own, I came to have the distinct impression that they were thoroughly sacramental and thoroughly obedient to a hierarchy already existent within the Church. In other words, they were not Protestants, Evangelicals, or Fundamentalists. The early Fathers had been thoroughly Catholic. I found the theological terrain within Evangelicalism to be in crisis. During college, I had majored in philosophy. I had come to the point where I no longer considered myself a Fundamentalist. The rigidity of its theology and the lack of charity were exhibited most clearly in its doctrine of “separation.” But overall, I had just come to disagree with too much that Fundamentalists held important. In seminary, however, I found that Evangelicalism was “all over the map.” There were disagreements about everything, even within the seminary itself. Some of the matters of disagreement were perhaps understandable: predestination, premillennialism, the ordinances of the church. But other issues seemed to be basic enough that there should have been some semblance of consistency. There was not. The most disturbing disagreements centered on the many Bible passages that had no plausible “Protestant” explanation. I had tucked some of them in the back of my mind before seminary. I was sure I would discover the answers to these passages. But rather than finding them answered, I found myself with a longer and longer list as I progressed through my training. I was surrounded by the brightest and best that Evangelicalism had to offer. My professors came from many different Protestant traditions. But none of them had a satisfying interpretation of these passages — even though these verses were in the one Book that they all agreed contained all they needed for salvation. Perhaps two examples might be helpful to illustrate this dilemma. First, how an all-loving and all-powerful God can allow human suffering has been a topic of discussion since long before the biblical Job suffered. As a college philosophy major, I read The Problem of Pain by C. S. Lewis for the first time. It made tremendous sense to me. Lewis’ major point is that suffering is not random. Suffering helps a Christian grow even when no one else knows about it. Suffering teaches unqualified obedience. This perspective made a tremendous amount of sense, but unfortunately it is incomplete when compared with Scripture. I remember once sitting in our living room with the president of Dallas Theological Seminary when I was a teenager. I had a question. How would he reconcile Colossians 1:24 with the idea of salvation by faith alone? St. Paul had written to the Colossians: “Now I rejoice in what was suffered for you, and I fill up in my flesh what is still lacking in regard to Christ’s afflictions, for the sake of his body, which is the church” (New International Version). Paul’s perspective on suffering was much more comprehensive than C. S. Lewis’ ideas. Paul attributed salvific merit to his own suffering, even for others. His perspective in this passage was not that people could be saved by “faith alone.” Somehow Paul assumed that the Colossians knew that faith must be perfected through suffering — dare I say, through works. He did not justify his statement as though it were a novel idea. He just stated it and moved on, as though no knowledgeable Colossian Christian would have had any doubt about his statement. I was surprised that the learned, holy, Fundamentalist president of Dallas Theological Seminary had no good way to reconcile this verse in Colossians with his soteriology (theology of salvation). But I could tell that he had obviously thought about it a great deal. Later in seminary, I encountered this phenomenon repeatedly. Verses existed that could not be reconciled with any Protestant tradition by any of the professors I encountered. But it seemed to me that if some of Scripture directly contradicted my theology, it was my responsibility to rethink the theology, not the Bible. Suffering and its role in salvation did not make sense to me until, long after seminary, I discovered the writings of Pope John Paul II. Somehow I got on a mailing list for a Catholic publisher. I was scandalized that they had somehow obtained my name. But I love books, so I stayed on the list. One day I saw a book in that publisher’s catalog that had organized topically the thinking of Pope John Paul II. The Pope had been so influential in the liberation of Europe that I thought I should read some of what he had to say. It was my first direct encounter with a faithful Catholic author. The Pope made clear that suffering is not enjoyable. But he insisted that it is essential to salvation. This thoroughly Catholic concept not only makes sense of the verse in Colossians; it infuses suffering with dignity. This was the beginning of my discovery that Catholic literature plumbed a depth of spirituality I had never even dreamed was available in print. Suffering’s role in our salvation is clearly taught in Scripture. I found no good explanation for this fact until I embraced the ancient faith of the Catholic Church. The biblical truth about suffering was only one of many truths I encountered that pressed me to explore Catholic teaching. I came to the firm conclusion that the best way to understand the Bible was to listen to the Catholic Church. Even so, a second example might be helpful. I had always believed in a version of premillennialism that teaches Christ will return very soon to set up a thousand-year reign in Jerusalem with the Jews. Most American premillennialists also believe this scenario entails a “rapture” that will take “true believers” out of the world. This “rapture” will allow a seven-year “Great Tribulation” that punishes unbelievers and prepares the world for Christ’s second coming. You may have heard of Christians who are striving to rebuild the Jerusalem temple, or seeking to breed the pure red heifer whose ashes, once sacrificed and burned, they believe are necessary to consecrate the temple site (see Numbers 19:1–10). These people are premillennialists. While in seminary, I pondered how to reconcile Christ’s finished work on the cross with any resumption of the Old Covenant animal sacrifices. The Book of Hebrews, for example, teaches that the old cult is no longer necessary and must pass away. The scholar’s face momentarily clouded with annoyance. I have never forgotten his next statement. He admitted that he knew of no plausible Evangelical explanation for these two verses. Zechariah 14:20–21 states prophetically: “On that day … the cooking pots in the Lord’s house will be like the bowls before the altar. Every cooking pot in Jerusalem and in Judah will be holy to the Lord of hosts; and all who come to sacrifice [in Jerusalem] will take some of the pots and cook in them” (NIV). Most premillennialists agree that this passage is speaking of a time after Christ’s first coming. Why is it so problematic for them? Because they understand these events to occur during the thousand-year reign of Christ over an earthly kingdom with its capital at Jerusalem. Here’s the rub. After Christ has died and set up His kingdom, why would sacrifices be resumed? There is absolutely no good Protestant response to that question. Evangelicals are adamant about the fact that priesthood here on earth is no longer needed. Sacrifices after the passion of Christ are unnecessary. The crucifixion of Christ was the last sacrifice ever needed. So why rebuild Jerusalem’s temple? This verse had remained an enigma to me for sixteen years, ever since seminary. When I was investigating Catholic Church teaching, I realized that Zechariah was actually talking about a sacrifice offered in Jerusalem every day now. He was referring to the Eucharist! 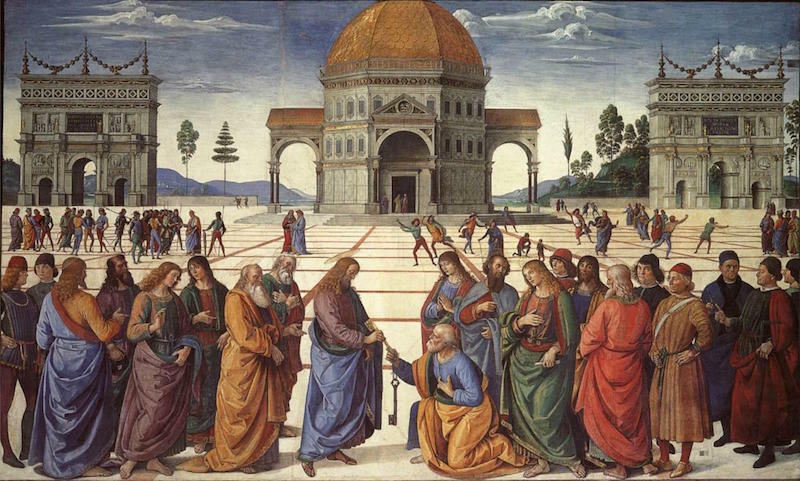 The Eucharist is the only sacrifice that would have any value after the Messiah’s passion because of its connection to the passion. The sacrifice of the Mass is being offered every day in Catholic churches, not only in Jerusalem, but all over the world. In other words, the continuing sacrifices of the Church were foretold in the Old Testament. When this reality dawned on me, I got so excited I ran into our living room and gave a “high five” to my thirteen-year-old son. We all reach certain critical decision points in our Christian pilgrimage. God gives us a choice: to follow or not to follow. These crisis points are never easy. They always involve sacrifice and suffering. And they are always an occasion of grace. At the rather late age of forty, I knew that I had approached one of these crisis points. I had been studying Scripture all my life. By this time, I had spent the previous months studying Catholic teaching in relation to Scripture. I had desperately attempted to find a reason not to become Catholic. I knew my family would lose friends. I knew my wife and children would have to start all over again in a new social circle. I knew that once I “went public” with these convictions, life could never again be the same. I hesitated, wondering if this was the right thing to do. One day I woke up and knew something for certain. I turned to my wife and said, “Colleen, I know that I believe.” We had been investigating and discussing so much that I did not even need to tell her what I believed. After months of study and discussion, she knew that I was referring to the Eucharist. I believed it really was Christ’s Body, Blood, Soul, and Divinity. This faith was a gift from God. It was not a bolt out of the blue. I had spent months trying to justify to myself what I had always believed: the Protestant interpretation of John 6. Jesus had said, “I am the living bread which came down from heaven; if any one eats of this bread, he will live forever; and the bread which I shall give for the life of the world is my flesh” (v. 51, emphasis added). After studying this text from a Catholic perspective, I knew in my head that the Church was right. John 6 clearly taught that the Body of Christ was the sustenance that I needed for eternity. Zechariah had predicted it. Jesus had instituted it. And only one Church in town taught this truth as Jesus stated it: the Catholic parish five blocks from my house. But that morning was different. That morning I woke up with the firm conviction in the center of my soul that the Church was correct about the Eucharist. I was certain of this divine truth. This grace was not a gift that I deserved. I do not know why I was singled out to receive it. Someone was obviously offering up prayers and sufferings for my enlightenment. 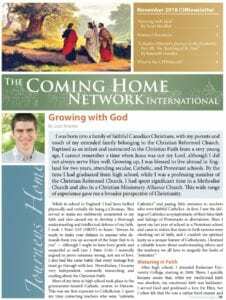 Several months later, through another grace of God, I was reconciled to the Catholic Church: not alone, but together with my wife and all six of our children. That was over twenty years ago. Since then, God has blessed us with two more children. I can honestly say that reconciling with the Church is the best thing our family has ever done. This Church is a wonderful place to raise a family and to travel on our pilgrimage to heaven. In fact, it is the only place God ever intended for us. David B. Currie is the author of three bestselling books. Born Fundamentalist, Born Again Catholic; Rapture: The End-Times Error that Leaves the Bible Behind; and What Jesus Really Said about the End of the World. David graduated from Holy Apostles Seminary (M.A. Theology) and is a research fellow with the St. Paul Center for Biblical Theology in Steubenville, Ohio. He and his wife, Colleen, have eight children and ten grandchildren.